Protesters rallied near Wall Street on Monday, moving police barricades and impeding traffic in a continuation of Sunday's massive climate change march in New York City. Today's demonstration, which organizers called "Flood Wall Street," drew an estimated 1,000 protesters. Starting in Battery Park along New York Harbor and proceeding up Broadway, the protesters stopped near the symbolic heart of Wall Street -- the famed "charging bull" statue -- to chant, wave signs and otherwise speak out against what they described as capitalism's role in climate change. 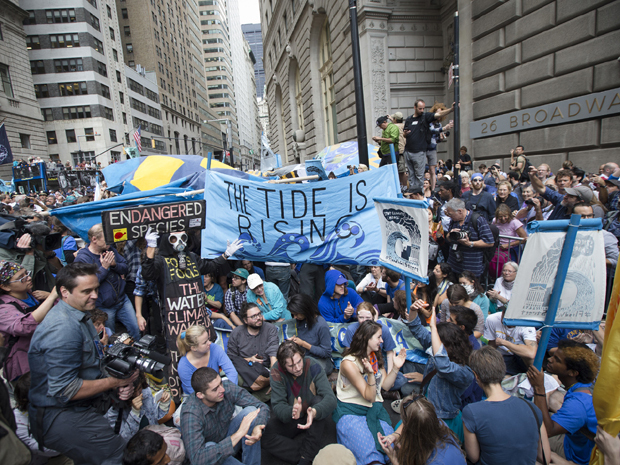 Activists said the goal of the event was to disrupt business in the financial district and put pressure on companies that profit from the sale of fossil fuels. "Being serious about tackling the climate crisis means we have to be willing to confront corporate capitalism and the system that is driving that crisis," said Tim DeChristopher, 32, a noted environmentalist. Clad in blue and accompanied by a marching band, protesters staged a sit-in on Broadway, while others clambered onto the ledge of a building to unfurl a sign that read "Flood Wall Street." Participants also passed around a 15-foot inflatable "carbon bubble" to dramatize the risks posed by global warming. Law enforcement officials blanketed the financial district before and during the march, cordoning off the area with metal gates. The many financial firms in the area also beefed up private security, with armed guards standing in front of some buildings. "It's interesting that they didn't blockade the buildings, they didn't blockade the streets -- they blockaded the bull," said DeChristopher, who, as detailed in a 2012 documentary, "Bidder 70," was released from prison in 2013 after serving two years for disrupting controversial auctions of public lands in Utah. "They want to protect that symbol because they don't want people to start envisioning a world where we can challenge the power structures and that kind of concentrated wealth." The heavy police presence, which included officers on horseback, seemed to keep disturbances to a minimum. Marchers planned to risk arrest by blocking the entrance of the New York Stock Exchange, but police efforts appeared to succeed in keeping them away from the NYSE's entrance. March organizers claimed police pepper-sprayed some protesters trying to access Wall Street, while other marchers removed some gates set up to control the event. There were reports of isolated arrests. The rally had the feel of the "Occupy Wall Street" protests in 2011, when protesters seized Zuccotti Park in lower Manhattan to decry the bank bailouts that followed the 2008 financial crisis and call attention to the rising gap between rich and poor. Participants today echoed many of the same themes, including the link between corporate power, global warming and economic inequality. A new CBS News/New York Times poll shows that most Americans think global warming is having a serious impact now or will in the future, with 54 percent believing that climate change is caused by human activity. "The most important thing about what we're doing here today is showing that if we don't change this system, we are going to lose this world as a place we want to live in," said Matthew McHale, a 31-year-old environmental activist who came to New York for this week's protests aboard the "People's Climate Train." "We need to transform the system, and by doing so transform the world into one that is more just and sustainable."